Whilst Barcelona are arguably the best side in the world with the history-making front three and excellent playmaking, they met an also-elite side in Atlético, who themselves are amongst the best even if for entirely different reasons. Under Simeone, Atlético have become arguably the world’s best defensive team with excellent organisational aspects and unbelievably high stability and control without the ball. They employ a solid deep block which has excellent spatial control using a positionally-oriented scheme with smaller man-orientations. Defending in their low-block, they rely on their control over the important spaces through a positionally-oriented defensive system. As they defend within a defined shape, they shift most efficiently from side-to-side blocking out passing lanes with the highest level of precision to close off the space. Yet when they met Barcelona away in Catalonia on Saturday, Simeone made somewhat of a surprise in their defensive strategy which saw them exert a high level of pressure on the champions of Europe. Moreover, Simeone’s side were heavily man-oriented in their pressing taking a significant shift away from their usual more zonal defensive strategy. Looking to press Barcelona even into the final third, they defended man-to-man with Barcelona in quite an aggressive manner which is typical of a Simeone side. There was also some typically-strong staggering from the away team as they often resembled more of a 4-1-3-2 shape as a holding midfielder would drop whilst the two wider players came inside slightly. This gave them better spatial compactness and coverage of passing lanes amidst the strong man-orientations higher up the pitch. When Barcelona had the ball in wider areas, it was a common sight that the ball-near winger would aggressively step up to put immediate pressure around the ball from around the same line as the two forwards. In co-ordination, you could often see the ball-far winger them moving more centrally to allow the midfield line to shift as they maintained spatial compactness during this mechanism. In making such an increased-level of pressure, Atlético benefit quite well through some good execution of the defensive strategy. They restricted Barcelona’s build-up game quite well as the home side struggled to make a clean development of the ball past the first phase. 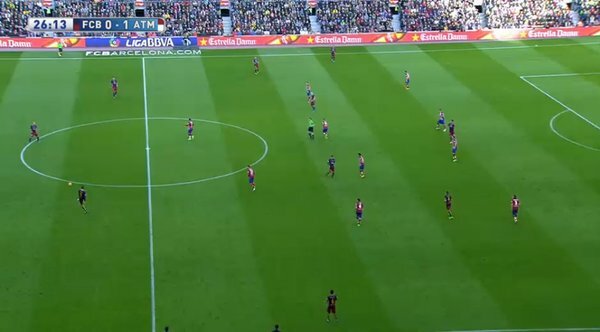 The pressing blocked the centre quite well and forced Barça away, towards the wide areas. After just 9 minutes had passed, Atlético made it 1-0 through a strong Koke shot following a cross from the right side. This situation was created after some strong pressing which forced a Barcelona turnover as the ball went out of play for a throw-in. Saul got the better of Alba on the resulting throw and made a deep cross which found it’s way to his teammate from the opposite wing. Atléti moved deeper into their more usual mid/low-block. Thanks to RM for this image. However, this pressure did not last for too long. It was obvious that Atlético would not be able to apply a consistent amount of high pressure throughout the full 90 minutes and they didn’t make it until the 30 minute mark before they moved deeper. One would not have been shocked to see Simeone immediately retreat into a deeper shape after taking the lead. After all, the side have one of (if not the) best defences in Europe and are more-than comfortable in defending long periods of time in a low block without trouble. However it took a couple of yellow cards, as well as the threatening accumulation of fatigue as a result of the demanding pressing game for Simeone to hold back his team slightly. The inevitable momentum shift was not in favour of the away team though as they gave Barcelona more space within the Atléti half whilst creating less of a threat on the counter themselves. Whilst benefiting from the forced change which Simeone made, Enrique made some smaller adaptions himself which impacted the outcome of the match. Barcelona’s shift in shape. Again thanks to RM. In the opening stages, we surprisingly saw the two full-backs occupy quite deep spaces during build-up, which limited Barcelona’s ability to access the centre in the midfield area. As the first half progressed however they began to take up higher positions as Busquets dropped between the centre-backs to balance and provide stability. 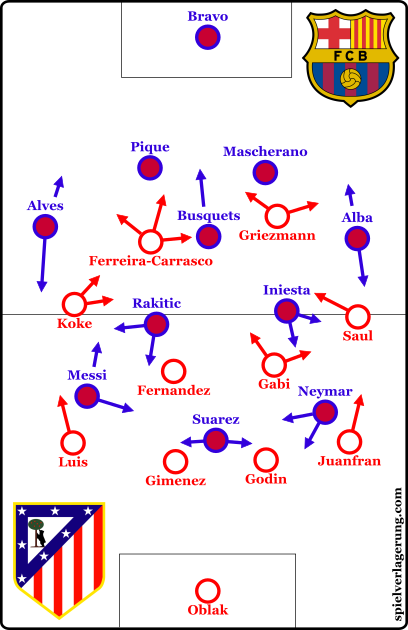 It was also interesting to see the midfield 8 pairing of Rakitic and Iniesta rotate too as the Spaniard would move to the right side whilst Rakitic took on a role on the left of the triangle. Amongst the front three, similar rotations could be seen between Messi and Suarez as the Argentine moved to a central role which we have seen him occupy so often in the past. Against Atlético’s man-orientations, Messi was able to create some valuable overloads by dropping into the midfield zone whilst the rotations across the team caused some disorientation in the Atléti defence. 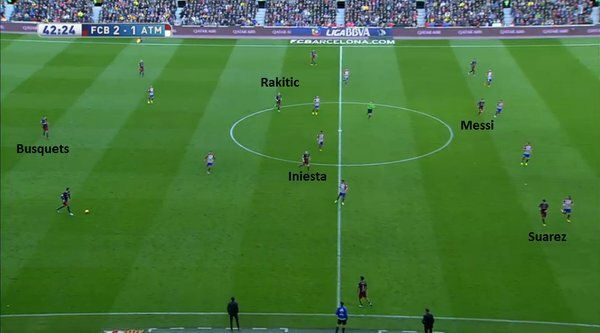 Whilst Rakitic’s role is largely based around his lateral movements to balance the structure, Iniesta was making similar runs which situationally could work against the man-marking of the opposition. After the first red card as Filipe Luis left the game, Atlético moved to a 4-4-1 shape. Although the end-result was now inevitable, Atléti still played admirably with even some attempts to make a high-press again which sometimes produced threatening attacks. In deeper spaces, they held a compact 4-4-1-0 shape with coverage of Busquets ahead of two narrow banks of four yet with a man less, replicating their normal levels of stability was difficult. Obviously, this task increased tenfold following the second dismissal and the inevitability of the result was simply reinforced. The game died whilst Atléti again changed, this time into a 4-3-1. Without little oppositional threat, the intensity of Barcelona decreased considerably with an emphasis on circulation of the ball with less intention to make attacks. Missing the two dismissed players, Atlético were simply unable to provide effective pressure and the game played out quite uneventfully over the remainder of the match. The two dismissals made for possibly an underwhelming match for most, though the developments through the game were crucial in the outcome and made for an interesting affair. Despite the weak start, Barcelona grew into the game supported by the momentum shift and Enrique’s adaptations whilst Simeone’s attempt to retreat into a low-block proved unsuccessful. Thanks must be given to the ever-great René (RM) for his assistance in the analysis as well as the above images from his twitter page!